The boat is in great shape, and the sails are in good shape. It has a 1998 Honda 15hp motor w/very low hours, 30Gl. fresh water tank, and a 20 Gl. gray water tank, AM/FM, CD player CB & VHF both new 2010, 4 New 2013 batteries, New 2013 rigging, 2 sails new 2008-9, 2 anchors, 1 windlass, 4 winches. 3 bilge pumps, The motor has a electric starter with controls in cockpit. 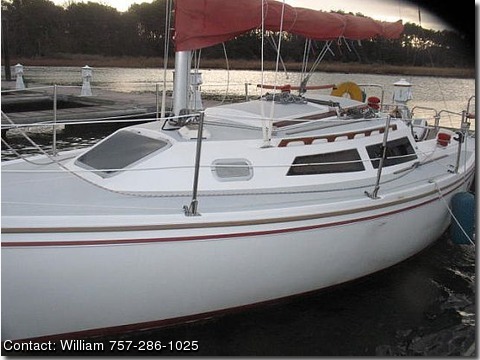 30amp inverter, 2 berths , full head, full stocked galley, 2 propane tanks. 6 life jackets, 4 new fire extinguishers, 2013 compass, new 2004 one hand held GPS, depthfinder, West Marine combo depth / chartplotter w/ charts new 2008, Auto pilot. It is ready to sail.